The Alpine Dojo was first opened in 1998 by Sempai Joe Vrtatic. After humble beginnings at the local school gymnasium, it was located at the Bright Sports Centre, in Gavan Street, using the Aerobics Room. 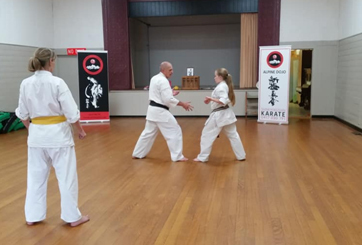 In 2001 Sempai Vrtatic moved to Geelong, and the dojo was taken over by Sensei Geoff Miller, a karateka & dojo operator, who had moved to the North East. 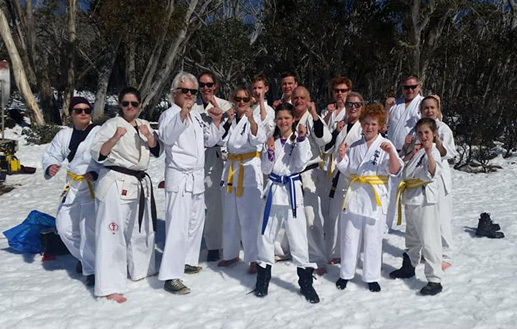 After celebrating the 20 Year Anniversary of the Dojo in August, including a Snow Training session on Mt Buffalo, the Alpine Dojo continues to be a thriving and dynamic karate club, offering classes for 5-9 year olds, Junior & Senior age groups. With a firm focus on excellence in technique, disciplined training, personal challenge and a supportive, family environment, we are committed to bringing out the best in our students. Our Instructors have current Level 2 First Aid,and Working with Children accreditation. The Dojo has formulated a policy which is compliant with Victorian Child Safe Standards legislation. The Instructors would sincerely like to thank the parents and local community for allowing our Dojo to grow and prosper.